In the depths of North Salem, a new brewery is pumping out some amazing beer.Â Pale Horse Brewing Company is a family run brewery in Salem, Oregon that is quietly ramping up to produce and deliver finely-crafted ales to the Willamette Valley. I recently met with Pale Horse President and Chief Brewer Dennis Clack and his brother Sid Clack at their North Salem location to get the story behind this up and coming Oregon brewery. Dennis got his start in brewing about 7 years ago.Â While perusing a local ShopKo, he spotted a Mr. Beer brewing kit.Â Dennis immediately started home-brewing and worked to perfect his craft.Â He entered a few local competitions including the Oregon State Fair and other festivals in the area.Â He got favorable results by winning ribbons and gaining some traction as he tweaked and enhanced his recipes. At a local competition, a judge told Dennis he simply had to bring Hillbilly Blonde, Clack’s then-signature blonde ale, to market.Â It was then Dennis decided to get serious about starting a microbrewery. 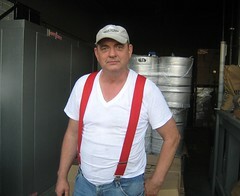 Pale Horse Brewing, according to brother Sid, is currently made up of “two slaves and one employee”.Â The brewery’s operations have thus far been funded by 4 family members who believe in Dennis’ vision and chances of building his business.Â Sid is the company’s treasurer and “chief broom pusher” (his words). At this point in time, Pale Horse Brewing offers two different types of beer.Â The first is Hillbilly Blonde, a blonde style ale.Â I asked Dennis why he decided to start with a blonde and he said it’s a nice transition for folks who are put off by the micro-brewery movement and are accustomed to drinking a more mainstream beer such as Budweiser or Coors.Â Hillbilly Blonde is a crisp, refreshing brew that is light in nature and goes down easy.Â I was able to taste a sample at the brewery and it is the perfect companion for a hot summer day when you want a beer that will refresh you instantly. Dennis’ other offering is Pale Horse Stout, which is an Irish style stout.Â Personally, I’m don’t normally go for darker beers as I favor an amber or IPA-style brew.Â However, I was very impressed with Pale Horse Stout.Â The stout is dark in color and doesn’t have the “toast” or coffee flavor that some stouts are known for.Â This beer goes down smooth and has a strong, but not overwhelming flavor. Knowing that many local brewers source their ingredients locally, I asked Dennis where he gets his materials for his craft brewing.Â Pale Horse uses pelleted hops that are bought from the hop union located out of Yakima, Washington.Â The brewer isn’t certain, but he believes that a portion of his hops are grown locally in the Willamette Valley and Yakima Valley region.Â As for the malt and barley used in his process, Dennis sources these from Great Western Grains from Vancouver, Washington. Pale Horse has four 15-barrel tanks that they power their operation currently.Â The finished product is currently kegged and bottled.Â According to Sid, about 75% of Pale Horse beer is bottled with the other 25% being kegged. All of Pale Horse’s existing outlets including bars and grocery stores have been self-marketed by the company.Â Dennis and Sid are very excited to have just signed a distribution deal with General Distributors in Portland, Oregon which will open up more markets for their beer.Â Portland, for those unaware, is a lucrative market as many folks in the Portland area desire micro-brewed beer, especially locally made beer. Pale Horse has been in operation since January 2009.Â With marketing and business development, they have signed on roughly 30 outlets including bars and grocery stores up and down the mid-Willamette Valley for customers to buy Pale Horse Beer.Â Recently, the Salem daily newspaper, the Statesman-Journal, featured Pale Horse Brewing in an article that brought some major attention to the family-run business.Â Immediately following, Eugene’s local ABC affiliate did a story about the brewery on a local news cast. 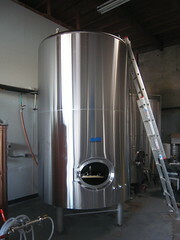 With future growth in mind, Pale Horse is upgrading their brewing capacity.Â In addition to the existing 15-barrel tanks, Dennis just recently added a brand new (and colossal) 90-barrel tank that will drastically increase the volume he can produce.Â Also, the brewery has added a second cooler to help keep bottles and kegs cool for distribution. Pale Horse is very excited about ramping up to start delivery of their third ale offering.Â An India Pale Aale (the name has yet to be announced) is Dennis’ latest creation and he is very proud of it.Â I had the opportunity to taste the IPA, straight from the tank and I can tell you: mid-Valley beer lovers are in for a treat!Â The IPA is quite hoppy, coming in at around 70 on the IBU factor and has about 7% alcohol.Â I found the IPA to be hoppy but well balanced and will make a fine addition to Pale Horse’s array of ale offerings. Where can you find some Hillbilly Blonde or Pale Horse Stout?Â At many local retailers in the Salem area including Roth’s Fresh Markets and Bi-Mart.Â Many bars in the Salem area feature Pale Horse on tap including Morton’s Seafood, Wild Pear Downtown.Â If you are near Corvallis, Woodstock’s Pizza features Pale Horse beer.Â If you are looking and find your local market or grocery store doesn’t have Pale Horse – I’d recommend asking the manager to stock it. Pale Horse is located in North Salem and they do dock sales as well – direct to consumers.Â Per regulations, they can sell no less than 5 gallons at the dock.Â This is a nice option to buy pony or regular sized kegs your home or social/business gatherings. 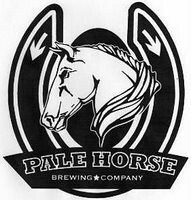 Pale Horse Brewing is located at 2359 Hyacinth St. NE Salem, Oregon.Â Their phone number is (503) 364-3610. I sent you a bunch of art, including the IPA dog. You can go with it any time. We have it in kegs and have sold the first one. Good coverage Mr. Harris! I would like to try the blonde and the new IPA. Thanks for the feedback, Josh! Hey Dennis, This is Jesse Creswell from Kerr about three years ago. I was walking through Roth’s and seen your beer. That was the coolest thing to see. It made my day to see that, actually it made a few nights too. It makes me feel good that your dream came true that is so awsome. congratulations man. Thanks for the comment! I’ve already started a Pale Horse Fan page on Facebook. To find it, just search for Pale Horse on FB.